Between getting older and the way that social media brings past acquaintances back into our lives, I’ve been thinking about the relationships we pick up again after years without contact: the college friends we meet again at reunions, the family members who show up for the first Christmas since the nineties, and especially the people we were involved with as teenagers. As a writer, I like all that complication a lot. That’s why I made Erik and Toinette, the hero and heroine of Highland Dragon Master, friends from their teenage years—well, sort of friends, in that like/dislike/crush way that sometimes happens as people grow from twelve to eighteen in near proximity. Of course, because they’re both long-lived dragon shifters, they have more time to spend apart before the start of the book. By the time Erik hires Toinette, her ship, and her crew to take him on an expedition seeking a legendary island and possible treasure, both of them have lived a hundred years or more: time enough to have established their own lives, encountered the world, and become different people. When everything’s gone right, of course, that’s also one of the appeals of a reunion with someone from your youth, especially someone you had a crush on. 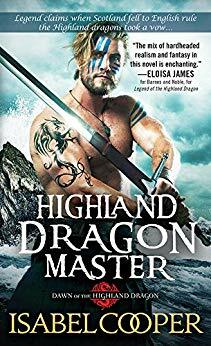 It’s a good feeling knowing that the object of your teenage infatuation now finds you all kinds of attractive and impressive—and in Highland Dragon Master, I tried to give both Erik and Toinette that moment. It helps that they both have plenty of opportunity to show off their skills: battling storms and demons is a nice chance for anyone to look good!